This course will teach users how to effectively administer the Elan learning management system. 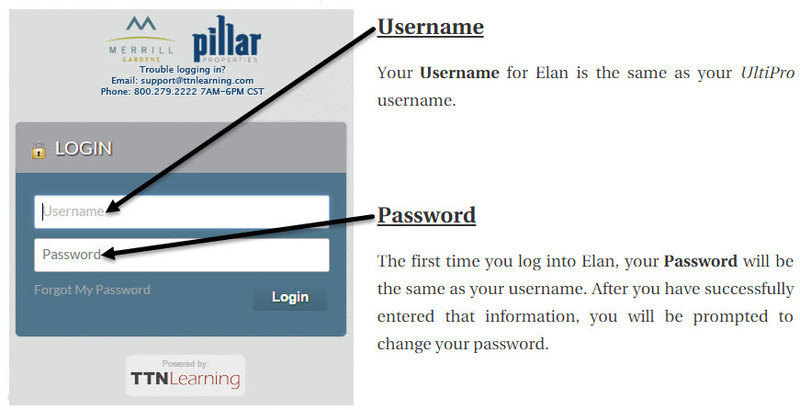 The Administrator will log into Elan using their username and password. To access the Elan learning management system, you must open UltiPro. Once in UltiPro, go to the My Company section. On the My Company page, click on the Company Info tab. When that tab opens, there is a list of links and/or documents that you can launch from inside UltiPro. Click on the "Elan LMS" link to launch Elan. If you have any questions throughout this course or any other time, please contact us via [email protected]. 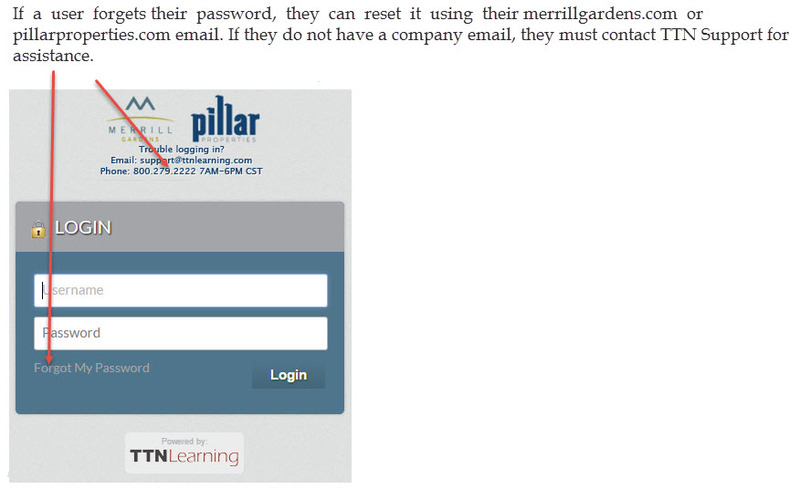 Enter your login information on the screen shown below. Your Elan username is the same as what other software? What is your Elan username? The Administrator will access the Administration area in Elan. 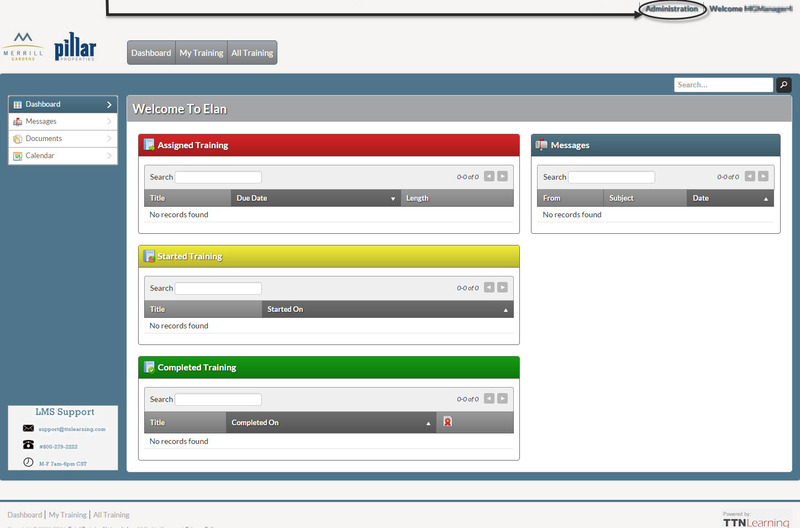 When you log into Elan, you will be taken to the Front End Dashboard. The Front End is where you access all of the training associated with your profile. 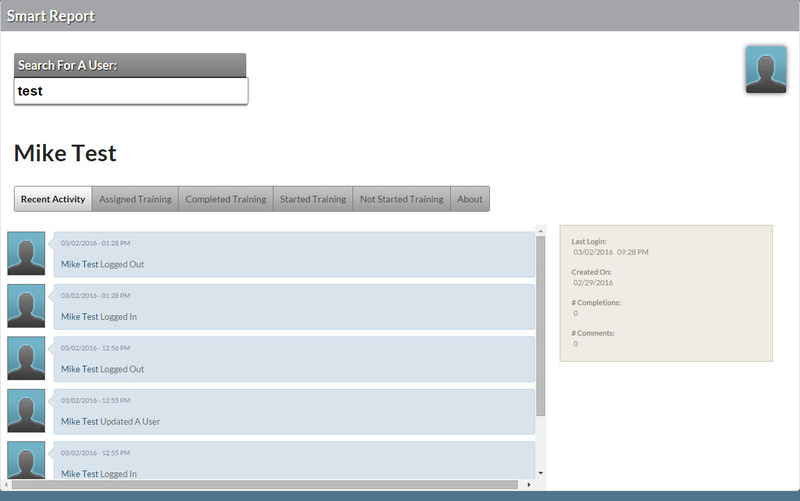 You would launch your training courses and view your training history from the Front End dashboard. Additional training for the Front End is available in the Elan Front End Training course. To perform administrative functions within Elan, you will have to enter into the Administration area. To access the Administration area, select the Administration link in the upper right corner of the page. See image below. The Administrator will review the tiles on the Administration Dashboard and demonstrate the use of each. You are now in the Administration area of Elan. One noticeable way to identify this is the top banner. When in the Administration area, it turns to a dark color. See the image below. The Administration Dashboard can be used for quick access to the three functions listed on each: Smart Report, Static Reports and Users. The tiles that appear on the Administration Dashboard may vary by user, depending on access level. Smart Report - Search for names of users that you have access to. If your search results in multiple users that match your criteria, all matching records will appear below. Select the desired name to view the following items for that user: Recent Activity, Assigned Training, Completed Training, Started Training, Not Started Training and About. Static Reports - Predetermined report templates that can be used to gather various training data. The reports available on this page are: Assigned Objects Status Report, Started Objects Report, Complex Object Progress Report, Object Status Report, Individual Survey Results Report, Question-level Quiz Report, Consolidated Quiz Report and Consolidated Survey Report. All Static Reports have a description next to the title. Users - Shows a list of all users that you have access to. You can sort the list by clicking on the column header. If a particular user does not appear on the list, then they are not a member of the groups that you have administrative access to. This is simply a list of names. You do not have the ability to add new users or edit profiles of existing users. Information in Team Member's profiles comes directly from UltiPro. If you believe that the information is incorrect, please email UltiPro Support ([email protected]) for guidance. All tiles on the Administration Dashboard are also available from the Top Menu. Additional training for the Top Menu and Reports is available in upcoming sections. ﻿As an Administrator in Elan, you have the ability to change the first name of a Team Member if they prefer to use a nickname instead. The Administrator will review the top menu and demonstrate each item. The Administration area also contains a Top Menu. The Top Menu will be present in all screens of the Administration area. A menu will also appear in the left margin when a button in the Top Menu is clicked. The left menu shows the same items as those in the Top Menu. The Top Menu contains three buttons: Dashboard, Users/Groups and Report Engine. 1. Dashboard - The first item in the Top Menu is Dashboard. The Dashboard is also referred to as "Administration Dashboard." It is the page that loads when you enter into the Administration area. As previously discussed, the Dashboard contains three tiles. See the "Administration Dashboard Tiles" section for descriptions of each. 2. Users/Groups - The second Top Menu item is Users/Groups. This button performs the same function as the Users tile described in the previous section, "Administration Dashboard Tiles." It shows a list of all users that you have access to. 3. Report Engine - The Report Engine button gives direct access to a variety of reports that are available to Elan Administrators. They include: Report Dashboard, Smart Report, Static Reports, Custom Reports and Chart Reports. The next section describes each of these reports in detail. The Administrator will define the purpose and run each report available to them and evaluate the results. There are many reporting features within Elan. All reports will reflect the data applicable to the Users or Groups they are in. Each type of report and their purpose are described in the sections of this module. At the end of the section, you should run the report to evaluate the results. You will only be able to view results for the users that you have access to. If the reports return blank results, you may have to adjust your criteria to something that contains valid data. The Report Dashboard provides a quick glance at key statistics. 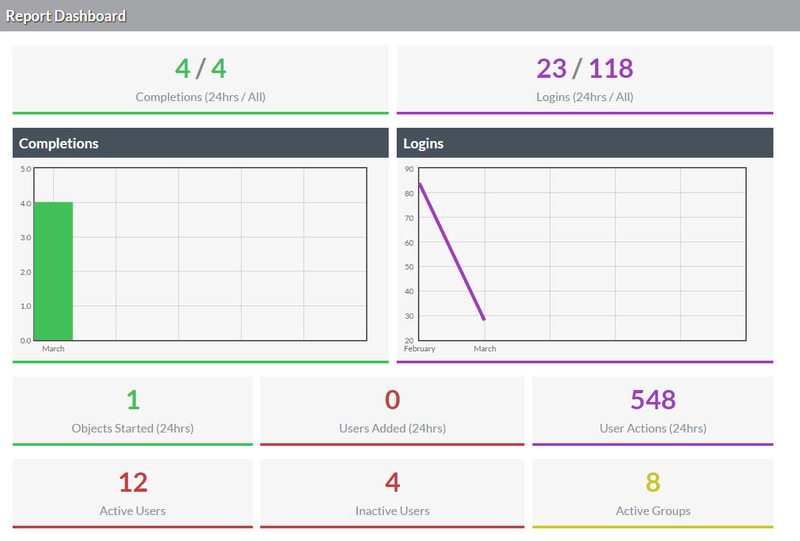 The information on this dashboard includes Completions (last 24 hours and total), Logins (last 24 hours and total), Objects Started, Users Added, User Actions, Active Users, Inactive Users and Active Groups. Smart Reports can be used to quickly search for names of users that you have access to view the following items for a user: Recent Activity, Assigned Training, Completed Training, Started Training, Not Started Training and About. This is the same Smart Report that can be launched from the Administration Dashboard tile. Static Reports are predetermined report templates that can be used to gather various training data. The Static Reports available on this page are: Assigned Objects Status Report, Completed Objects Report, Started Objects Report, Complex Object Progress Report, Object Status Report, Individual Quiz Report, Individual Survey Report, Consolidated Quiz Report and Consolidated Survey Report. Click the Run Report button to process any of the reports. Below are descriptions of each report available to you. Assigned Objects Status Report - This report displays all assigned objects for your users and their status for each assigned object. The status could be Complete, Started or Not Started. This report automatically opens as a comma separated value (csv) file, using Microsoft Excel. Completed Object Progress Report - This report displays all completed objects for your users. This report automatically opens as a csv file, using Microsoft Excel. Started Objects Report - This report displays all started, but incomplete, objects for your users. This report automatically opens as a csv file, using Microsoft Excel. Complex Object Progress Report - This report displays the progress of complex objects (an organized grouping of training modules or courses) for your users. Select the desired object(s) and user(s). This report will load directly in the Elan framework. Click on the View Progress link on any row for more information on that line item. Object Status Report - This report displays the status of all objects for your users. Select the desired object(s) and user(s). This report automatically opens as a csv file, using Microsoft Excel. 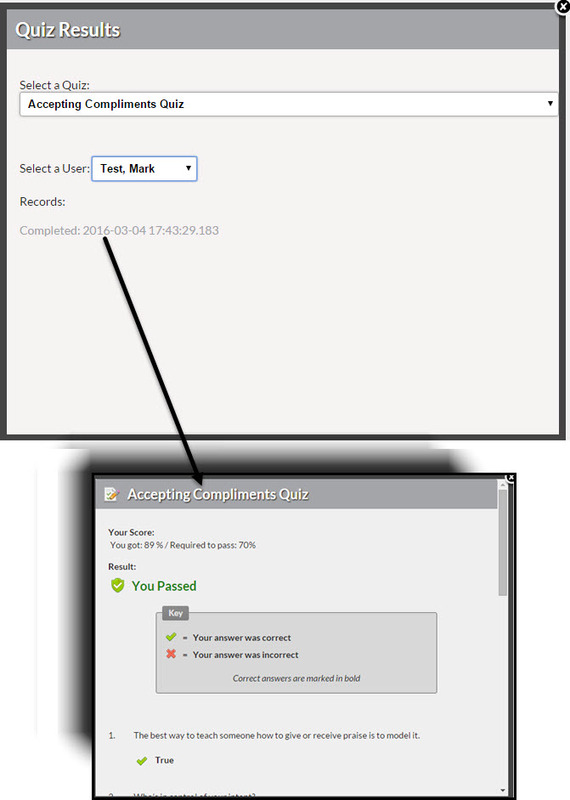 Individual Quiz Report - This report displays the detailed quiz results for an individual user. Select the desired quiz and user. This report will load into an Elan pop-up window. Click on the status link below "Records" to view the results. 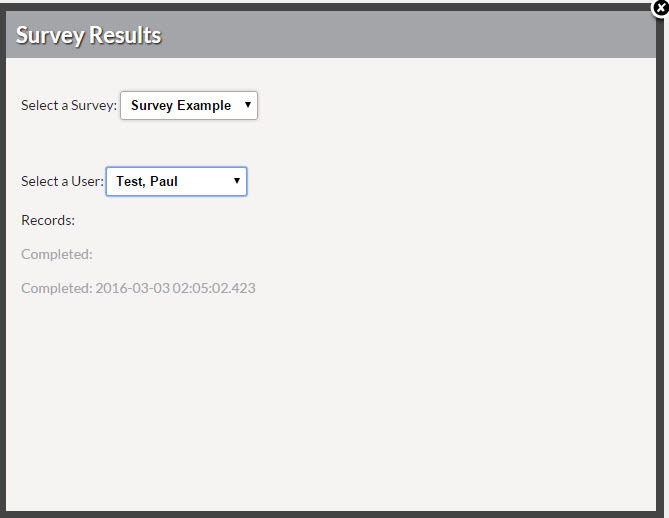 Individual Survey Report - This report displays the detailed survey results for an individual user. Select the desired survey and user. Consolidated Quiz Report - This report pulls up a summary for a specific quiz. It shows all quiz questions and answers, giving a percentage of responses for each answer. Correct answers will have a green check mark next to them. You can elect to run the report for a specific date range. This report will load directly in the Elan framework. Consolidated Survey Report - This report pulls up a summary for a specific survey. 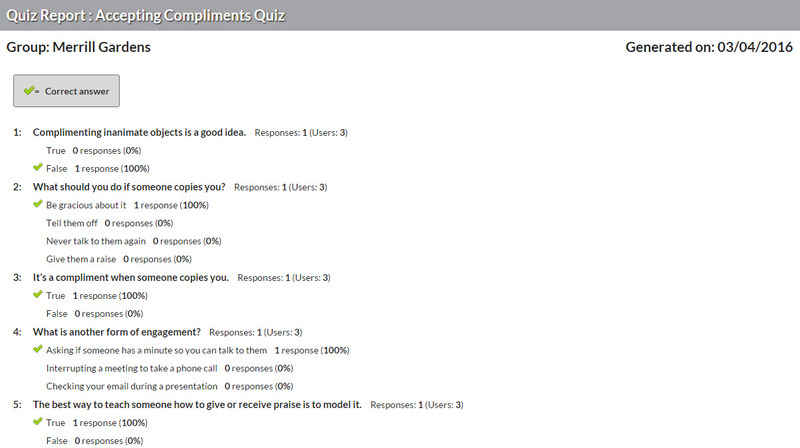 It shows all survey questions and answers, giving a percentage of responses for each answer. Essay questions will show "various responses" in the answer area due to their free-form nature. You can elect to run the report for a specific date range. This report will load directly in the Elan framework. The Custom Report builder allows an administrator to create a report that targets specific items that are needed. The types of reports that can be customized use basic templates that determine what results to pull. Each custom report can be generated immediately or setup as a recurring report that is emailed on a monthly, weekly, or daily basis. Activity Report – This report allows you to tailor the criteria based on any object in the system for users that you have access to. The results shows the selected user's status of each selected object that was chosen when building the report. Once you have selected the users and objects to report on, you can choose certain data columns to include in the report to show the information needed. This report automatically opens as a csv file, using Microsoft Excel. Assignment Report - This report allows you to tailor the criteria based on any object in the system that are assigned to users that you have access to. The results shows the selected user's status of each selected object that was chosen when building the report. Once you have selected the users and objects to report on, you can choose certain data columns to include in the report to show the information needed. This report automatically opens as a csv file, using Microsoft Excel. User Report - This report allows you to tailor the criteria to view any users that you have access to. Once you have selected the users and objects to report on, you can choose certain data columns to include in the report to show the information needed. This report automatically opens as a csv file, using Microsoft Excel. Object Report - This report allows you to select specific objects and see the detailed information of each. Once you have selected the objects to report on, you can choose certain data columns to include in the report to show the information needed. This report automatically opens as a csv file, using Microsoft Excel. 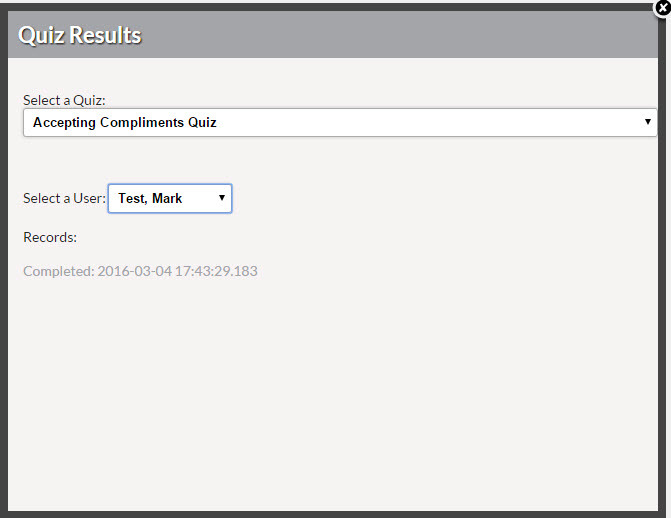 Quiz Report - This report allows you to tailor the criteria based on any one quiz in the system for users that you have access to. Once you have selected the objects to report on, you can choose certain data columns to include in the report to show the information needed. The results automatically show the user's response for each question in the quiz. This report automatically opens as a csv file, using Microsoft Excel. Survey Report - This report allows you to tailor the criteria based on any one survey in the system for users that you have access to. Once you have selected the objects to report on, you can choose certain data columns to include in the report to show the information needed. The results automatically show the user's response for each question in the survey. This report automatically opens as a csv file, using Microsoft Excel. The Chart Report allows you view specific actions within a specified time period for users that you have access to. First, select the time period from the drop down. Second, select the type of action that you want to report on from the other drop down. 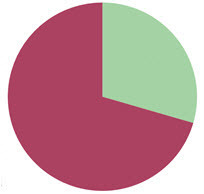 The results of this report can be displayed in three (3) different chart formats: bar, line and pie. Which reports can be opened with Microsoft Excel? Match the description to the proper Static Report. This report displays the status of all objects for your users. This report pulls up summary for a specific quiz. This report displays the detailed quiz results for an individual user. This report displays all assigned objects for your users and their status for each assigned object. This report displays the progress of complex objects for your users. This report pulls up a summary for a specific survey. This report displays all completed objects for your users. This report displays the detailed survey results for an individual user. This report displays all started, but incomplete, objects for your users. The Administrator will navigate from the Administration area back to the Front End. If you are done performing you administrative functions in Elan, you can return to the Front End dashboard. Remember, you can only take courses from the Front End. Additional training for the Front End is available in the Elan Front End Training course. To return to the Front End area, simply select the Front End link in the upper right corner of the page. See image below.